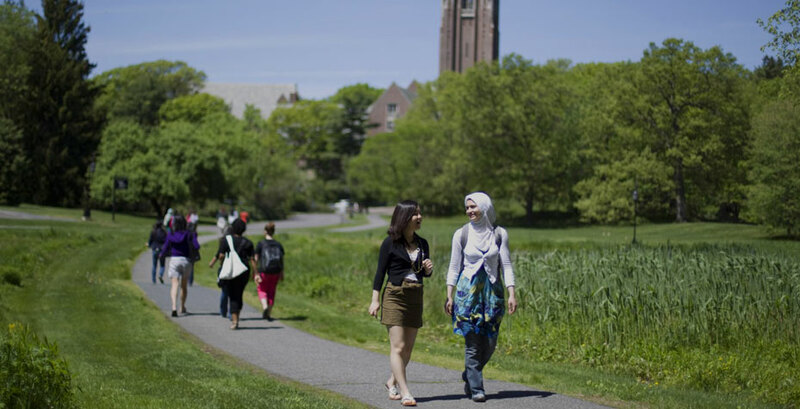 A sunny day greets the Wellesley community as the academic year opens on September 3, 2013. With afternoon thunderstorms in the forecast, the first day of classes concludes with Convocation indoors in Diana Chapman Walsh Alumnae Hall, with a procession under awnings from the Lulu Chow Wang Campus Center. Convocation marks the official start of the academic year. It is an important tradition at Wellesley—not only does it celebrate the beginning of the new year, but it provides an opportunity for faculty, staff, and students to gather together and participate in the College's vibrant intellectual community. Convocation is a special time for the Wellesley community, calling for academic dress: Faculty wear robes depicting their fields of study and alma maters, and seniors dress—for the first time—in the robes that they will wear on Commencement Day. Faculty and seniors march in procession from the Davis Museum Plaza to the amphitheater in parallel lines at 4:15 p.m. The 2013 Convocation speeches will be livestreamed on Tuesday, September 3, and the texts of the speeches will be available online in the following days. Stepsinging, another Wellesley tradition, takes place immediately following the Convocation ceremony.